* St. Augustine (d. 430) warns the faithful: “Let us not listen to those who deny that the Church of God has power to forgive all sins” (De agon. Christ., iii). * St. Ambrose (d. 397) rebukes the Novatianists who “professed to show reverence for the Lord by reserving to Him alone the power of forgiving sins. Greater wrong could not be done than what they do in seeking to rescind His commands and fling back the office He bestowed. . . . The Church obeys Him in both respects, by binding sin and by loosing it; for the Lord willed that for both the power should be equal” (De poenit., I, ii,6). * Again he teaches that this power was to be a function of the priesthood. “It seemed impossible that sins should be forgiven through penance; Christ granted this (power) to the Apostles and from the Apostles it has been transmitted to the office of priests” (op. cit., II, ii, 12). * The power to forgive extends to all sins: “God makes no distinction; He promised mercy to all and to His priests He granted the authority to pardon without any exception” (op. cit., I, iii, 10). * Against the same heretics St. Pacian, Bishop of Barcelona (d. 390), wrote to Sympronianus, one of their leaders: “This (forgiving sins), you say, only God can do. Quite true: but what He does through His priests is the doing of His own power” (Ep. I ad Sympron, 6 in P.L., XIII, 1057). * In the East during the same period we have the testimony of St. Cyril of Alexandria (d. 447): “Men filled with the spirit of God (i.e. priests) forgive sins in two ways, either by admitting to baptism those who are worthy or by pardoning the penitent children of the Church” (In Joan., 1, 12 in P.G., LXXIV, 722). * St. John Chrysostom (d. 407) after declaring that neither angels nor archangels have received such power, and after showing that earthly rulers can bind only the bodies of men, declares that the priest’s power of forgiving sins “penetrates to the soul and reaches up to heaven”. Wherefore, he concludes, “it were manifest folly to condemn so great a power without which we can neither obtain heaven nor come to the fulfillment of the promises. . . . Not only when they (the priests) regenerate us (baptism), but also after our new birth, they can forgive us our sins” (De sacred., III, 5 sq.). * St. Athanasius (d. 373): “As the man whom the priest baptizes is enlightened by the grace of the Holy Ghost, so does he who in penance confesses his sins, receive through the priest forgiveness in virtue of the grace of Christ” (Frag. contra Novat. in P. G., XXVI, 1315). The distinction between sins that could be forgiven and others that could not, originated in the latter half of the second century as the doctrine of the Montanists, and especially of Tertullian. While still a Catholic, Tertullian wrote (A.D. 200-6) his “De poenitentia” in which he distinguishes two kinds of penance, one as a preparation for baptism, the other to obtain forgiveness of certain grievous sins committed after baptism, i.e., apostasy, murder, and adultery. For these, however, he allows only one forgiveness: “Foreseeing these poisons of the Evil One, God, although the gate of forgiveness has been shut and fastened up with the bar of baptism, has permitted it still to stand somewhat open. In the vestibule He has stationed a second repentance for opening to such as knock; but now once for all, because now for the second time; but never more, because the last time it had been in vain. . . . However, if any do incur the debt of a second repentance, his spirit is not to be forthwith cut down and undermined by despair. Let it be irksome to sin again, but let it not be irksome to repent again; let it be irksome to imperil oneself again, but let no one be ashamed to be set free again. Repeated sickness must have repeated medicine” (De poen., VII). Tertullian does not deny that the Church can forgive sins; he warns sinners against relapse, yet exhorts them to repent in case they should fall. His attitude at the time was not surprising, since in the early days the sins above mentioned were severely dealt with; this was done for disciplinary reasons, not because the Church lacked power to forgive. In the minds, however, of some people the idea was developing that not only the exercise of the power but the power itself was limited. Against this false notion Pope Callistus (218-22) published his “peremptory edict” in which he declares: “I forgive the sins both of adultery and of fornication to those who have done penance.” Thereupon Tertullian, now become a Montanist, wrote his “De pudicitia” (A. D. 217-22). In this work he rejects without scruple what he had taught as a Catholic: “I blush not at an error which I have cast off because I am delighted at being rid of it . . . one is not ashamed of his own improvement.” The “error” which he imputes to Callistus and the Catholics was that the Church could forgive all sins: this, therefore, was the orthodox doctrine which Tertullian the heretic denied. In place of it he sets up the distinction between lighter sins which the bishop could forgive and more grievous sins which God alone could forgive. Though in an earlier treatise, “Scorpiace”, he had said (c. x) that “the Lord left here to Peter and through him to the Church the keys of heaven” he now denies that the power granted to Peter had been transmitted to the Church, i.e., to the numerus episcoporum or body of bishops. Yet he claims this power for the “spirituals” (pneumatici), although these, for prudential reasons, do not make use of it. To the arguments of the “Psychici”, as he termed the Catholics, he replies: “But the Church, you say, has the power to forgive sin. This I, even more than you, acknowledge and adjudge. I who in the new prophets have the Paraclete saying: ‘The Church can forgive sin, but I will not do that (forgive) lest they (who are forgiven) fall into other sins” (De pud., XXI, vii). Thus Tertullian, by the accusation which he makes against the pope and by the restriction which he places upon the exercise of the power of forgiving sin, bears witness to the existence of that power in the Church which he had abandoned. Not content with assailing Callistus and his doctrine, Tertullian refers to the “Shepherd” (Pastor), a work written A.D. 140-54, and takes its author Hermas to task for favouring the pardon of adulterers. In the days of Hermas there was evidently a school of rigorists who insisted that there was no pardon for sin committed after baptism (Simil. VIII, vi). Against this school the author of the “Pastor” takes a resolute stand. He teaches that by penance the sinner may hope for reconciliation with God and with the Church. “Go and tell all to repent and they shall live unto God. Because the Lord having had compassion, has sent me to give repentance to all men, although some are not worthy of it on account of their works” (Simil. VIII, ii). Hermas, however, seems to give but one opportunity for such reconciliation, for in Mandate IV, i, he seems to state categorically that “there is but one repentance for the servants of God”, and further on in c. iii he says the Lord has had mercy on the work of his hands and hath set repentance for them; “and he has entrusted to me the power of this repentance. And therefore I say to you, if any one has sinned . . he has opportunity to repent once”. Repentance is therefore possible at least once in virtue of a power vested in the priest of God. That Hermas here intends to say that the sinner could be absolved only once in his whole life is by no means a necessary conclusion. His words may well be understood as referring to public penance (see below) and as thus understood they imply no limitation on the sacramental power itself. The same interpretation applies to the statement of Clement of Alexandria (d. circa A.D. 215): “For God being very merciful has vouchsafed in the case of those who, though in faith, have fallen into transgression, a second repentance, so that should anyone be tempted after his calling, he may still receive a penance not to be repented of” (Stromata, II, xiii). The existence of a regular system of penance is also hinted at in the work of Clement, “Who is the rich man that shall be saved?”, where he tells the story of the Apostle John and his journey after the young bandit. John pledged his word that the youthful robber would find forgiveness from the Saviour; but even then a long seriouspenance was necessary before he could be restored to the Church. And when Clement concludes that “he who welcomes the angel of penance . . . will not be ashamed when he sees the Saviour”, most commentators think he alludes to the bishop or priest who presided over the ceremony of public penance. Even earlier, Dionysius of Corinth (d. circa A.D. 17O), setting himself against certain growing Marcionistic traditions, taught not only that Christ has left to His Church the power of pardon, but that no sin is so great as to be excluded from the exercise of that power. For this we have the authority of Eusebius, who says (Hist. eccl., IV, xxiii): “And writing to the Church which is in Amastris, together with those in Pontus, he commands them to receive those who come back after any fall, whether it be delinquency or heresy”. The “Didache” (q.v.) written at the close of the first century or early in the second, in IV, xiv, and again in XIV, i, commands an individual confession in the congregation: “In the congregation thou shalt confess thy transgressions”; or again: “On the Lord’s Day come together and break bread . . . having confessed your transgressions that your sacrifice may be pure.” Clement I (d. 99) in his epistle to the Corinthians not only exhorts to repentance, but begs the seditious to “submit themselves to the presbyters and receive correction so as to repent” (c. lvii), and Ignatius of Antioch at the close of the first century speaks of the mercy of God to sinners, provided they return” with one consent to the unity of Christ and the communion of the bishop”. The clause “communion of the bishop” evidently means the bishop with his council of presbyters as assessors. He also says (Ad Philadel,) “that the bishop presides over penance”. The transmission of this power is plainly expressed in the prayer used at the consecration of a bishop as recorded in the Canons of Hippolytus: “Grant him, 0 Lord, the episcopate and the spirit of clemency and the power to forgive sins” (c. xvii). Still more explicit is the formula cited in the “Apostolic Constitutions” (q.v. ): “Grant him, 0 Lord almighty, through Thy Christ, the participation of Thy Holy Spirit, in order that he may have the power to remit sins according to Thy precept and Thy command, and to loosen every bond, whatsoever it be, according to the power which Thou hast granted to the Apostles.” (Const. Apost., VIII, 5 in P. (i., 1. 1073). Written by Edward J. Hanna. Transcribed by Donald J. Boon. How firmly rooted in the Catholic mind is the belief in the efficacy and necessity of confession, appears clearly from the fact that the Sacrament of Penance endures in the Church after the countless attacks to which it has been subjected during the last four centuries. If at the Reformation or since the Church could have surrendered a doctrine or abandoned a practice for the sake of peace and to soften a “hard saying”, confession would have been the first to disappear. Yet it is precisely during this period that the Church has defined in the most exact terms the nature of penance and most vigorously insisted on the necessity of confession. It will not of course be denied that at the beginning of the sixteenth century confession was generally practised throughout the Christian world. The Reformers themselves, notably Calvin, admitted that it had been in existence for three centuries when they attributed its origin to the Fourth Lateran Council (1215). At that time, according to Lea (op. cit., I, 228), the necessity of confession “became a new article of faith” and the canon, omnis utriusque sexus, “is perhaps the most important legislative act in the history of the Church” (ibid., 230). But, as the Council of Trent affirms, “the Church did not through the Lateran Council prescribe that the faithful of Christ should confess—a thing which it knew to be by Divine right necessary and established—but that the precept of confessing at least once a year should be complied with by all and every one when they reached the age of discretion” (Sess., XIV, c. 5). The Lateran edict presupposed the necessity of confession as an article of Catholic belief and laid down a law as to the minimum frequency of confession—at least once a year. In constructing their systems of theology, the medieval doctors discuss at length the various problems connected with the Sacrament of Penance. They are practically unanimous in holding that confession is obligatory; the only notable exception in the twelfth century is Gratian, who gives the arguments for and against the necessity of confessing to a priest and leaves the question open (Decretum, p. II, De poen., d. 1, in P.L., CLXXXVII, 1519-63). Peter Lombard (d. about 1150) takes up the authorities cited by Gratian and by means of them proves that “without confession there is no pardon” . . . “no entrance into paradise” (IV Sent., d. XVII, 4, in P.L., CXCII, 880-2). The principal debate, in which Hugh of St. Victor, Abelard, Robert Pullus, and Peter of Poitiers took the leading parts, concerned the origin and sanction of the obligation, and the value of the different Scriptural texts cited to prove the institution of penance. This question passed on to the thirteenth century and received its solution in very plain terms from St. Thomas Aquinas. Treating (Contra Gentes, IV, 72) of the necessity of penance and its parts, he shows that “the institution of confession was necessary in order that the sin of the penitent might be revealed to Christ’s minister; hence the minister to whom the confession is made must have judicial power as representing Christ, the Judge of the living and the dead. This power again requires two things: authority of knowledge and power to absolve or to condemn. These are called the two keys of the Church which the Lord entrusted to Peter (Matthew 16:19). But they were not given to Peter to be held by him alone, but to be handed on through him to others; else sufficient provision would not have been made for the salvation of the faithful. These keys derive their efficacy from the passion of Christ whereby He opened to us the gate of the heavenly kingdom”. And he adds that as no one can be saved without baptism either by actual reception or by desire, so they who sin after baptism cannot be saved unless they submit to the keys of the Church either by actually confessing or by the resolve to confess when opportunity permits. Furthermore, as the rulers of the Church cannot dispense any one from baptism as a means of salvation neither can they give a dispensation whereby the sinner may be forgiven without confession and absolution. The same explanation and reasoning is given by all the Scholastics of the thirteenth and fourteenth centuries. They were in practical agreement as to the necessity of jurisdiction in the confessor. Regarding the time at which confession had to be made, some held with William of Auvergne that one was obliged to confess as soon as possible after sinning; others with Albertus Magnus and St. Thomas that it sufficed to confess within the time limits prescribed by the Church (Paschal Time); and this more lenient view finally prevailed. Further subjects of discussion during this period were the choice of confessor; the obligation of confessing before receiving other sacraments, especially the Eucharist; the integrity of confession; the obligation of secrecy on the part of the confessor, i.e., the seal of confession. The careful and minute treatment of these points and the frank expression of divergent opinions were characteristic of the Schoolmen but they also brought out more clearly the central truths regarding penance and they opened the way to the conciliar pronouncements at Florence and Trent which gave to Catholic doctrine a more precise formulation. See Vacandard and Bernard in “Dict. de theol. cath.”, s.v. Confession; Turmel, “Hist. de la theologie positive”, Paris, 1904; Cambier, “De divina institutione confessionis sacramentalis”, Louvain, 1884. Not only was the obligation recognized in the Catholic Church throughout the Middle Ages, but the schismatic Greeks held the same belief and still hold it. They fell into schism under Photius in 869, but retained confession, which therefore must have been in use for some time previous to the ninth century. The practice, moreover, was regulated in detail by the Penitential Books (q.v. ), which prescribed thecanonical penance for each sin, and minute questions for the examination of the penitent. The most famous of these books among the Greeks were those attributed to John the Faster and to John the Monk. In the West similar works were written by the Irish monks St. Columbanus (d. 615) and Cummian, and by the Englishmen Ven. Bede (d. 735), Egbert (d. 767), and Theodore of Canterbury (d. 690). Besides the councils mentioned above (Minister) decrees pertaining to confession were enacted at Worms (868), Paris (820), Châlons (813, 650), Tours (813), Reims (1113). The Council of Chaleuth (785) says: “if any one (which God forbid) should depart this life without penance or confession he is not to be prayed for”. The significant feature about these enactments is that they do not introduce confession as a new practice, but take it for granted and regulate its administration. Hereby they put into practical effect what had been handed down by tradition. St. Gregory the Great (d. 604) teaches “the affliction of penance is efficacious in blotting out sins when it is enjoined by the sentence of the priest when the burden of it is decided by him in proportion to the offence after weighing the deeds of those who confess” (In I Reg., III, v, n. 13 in P.L., LXXIX, 207); Pope Leo the Great (440-61), who is often credited with the institution of confession, refers to it as an “Apostolic rule”. Writing to the bishops of Campania he forbids as an abuse “contrary to the Apostolic rule” (contra apostolicam regulam) the reading out in public of a written statement of their sins drawn up by the faithful, because, he declares, “it suffices that the guilt of conscience be manifested to priests alone in secret confession” (Ep. clxviii in P.L., LIV, 1210). In another letter (Ep. cviii in P. L., LIV, 1011), after declaring that by Divine ordinance the mercy of God can be obtained only through the supplications of the priests, he adds: “the mediator between and men, Christ Jesus, gave the rulers of the Church this power that they should impose penance on those who confess and admit them when purified by salutary satisfaction to the communion of the sacraments through the gateway of reconciliation. “The earlier Fathers frequently speak of sin as a disease which needs treatment, something drastic, at the hands of the spiritual physician or surgeon. St. Augustine (d. 450) tells the sinner: “an abscess had formed in your conscience; it tormented you and gave you no rest. . . . confess, and in confession let the pus come out and flow away” (In ps. lxvi, n. 6). St. Jerome (d. 420) comparing the priests of the New Law with those of the Old who decided between leprosy and leprosy, says: “likewise in the New Testament the bishops and the priest bind or loose . . . in virtue of their office”, having heard various sorts of sinners, they know who is to be bound and who is to be loosed” . . . (In Matt., xvi, 19); in his “Sermon on Penance” he says: “let no one find it irksome to show his wound vulnus confiteri) because without confession it cannot be healed.” St. Ambrose (d. 397): “this right (of loosing and binding) has been conferred on priests only” (De pen., I, ii, n. 7); St. Basil (d. 397): “As men do not make known their bodily ailments to anybody and everybody, but only to those who are skilled in healing, so confession of sin ought to be made to those who can cure it” (Reg. brevior., 229). For those who sought to escape the obligation of confession it was natural enough to assert that repentance was the affair of the soul alone with its Maker, and that no intermediary was needed. It is this pretext that St. Augustine sweeps aside in one of his sermons: “Let no one say I do penance secretly; I perform it in the sight of God, and He who is to pardon me knows that in my heart I repent”. Whereupon St. Augustine asks: “Was it then said to no purpose, ‘What you shall loose upon earth shall be loosed in heaven?’ Was it for nothing that the keys were given to the Church?” (Sermo cccxcii, n. 3, in P.L., XXXIX, 1711). The Fathers, of course, do not deny that sin must be confessed to God; at times, indeed, in exhorting the faithful to confess, they make no mention of the priest; but such passages must be taken in connection with the general teaching of the Fathers and with the traditional belief of the Church. Their real meaning is expressed, e.g., by Anastasius Sinaita (seventh century): “Confess your sins to Christ through the priest” (De sacra synaxi), and by Egbert, Archbishop of York (d. 766): “Let the sinner confess his evil deeds to God, that the priest may know what penance to impose” (Mansi, Coll. Conc., XII, 232). For the passages in St. John Chrysostom, see Hurter, “Theol. dogmat.”, III, 454; Pesch, “Praelectiones”, VII, 165. The Fathers, knowing well that one great difficulty which the sinner has to overcome is shame, encourage him in spite of it to confess. “I appeal to you, my brethren”, says St. Pacian (d. 391), “. . . you who are not ashamed to sin and yet are ashamed to confess . . . I beseech you, cease to hide your wounded conscience. Sick people who are prudent do not fear the physician, though he cut and burn even the secret parts of the body” (Paraenesis ad poenit., n. 6, 8). St. John Chrysostom (d. 347) pleads eloquently with the sinner: “Be not ashamed to approach (the priest) because you have sinned, nay rather, for this very reason approach. No one says: Because I have an ulcer, I will not go near a physician or take medicine; on the contrary, it is just this that makes it needful to call in physicians and apply remedies. We (priests) know well how to pardon, because we ourselves are liable to sin. This is why God did not give us angels to be our doctors, nor send down Gabriel to rule the flock, but from the fold itself he chooses the shepherds, from among the sheep He appoints the leader, in order that he may be inclined to pardon his followers and, keeping in mind his own fault, may not set himself in hardness against the members of the flock” (Hom. “On Frequent Assembly” in P.G., LXIII, 463). Tertullian had already used the same argument with those who, for fear of exposing their sins, put off their confession from day to day—“mindful more of their shame than of their salvation, like those who hide from the physician the malady they suffer in the secret parts of the body, and thus perish through bashfulness. . . . because we withhold anything from the knowledge of men, do we thereby conceal it from God? . . . Is it better to hide and be damned than to be openly absolved?” ("De poenit.”, x). St. Cyprian (d. 258) pleads for greater mildness in the treatment of sinners, “since we find that no one ought to be forbidden to do penance and that to those who implore the mercy of God peace can be granted through His priests. . . . And because in hell there is no confession, nor can exomologesis be made there, they who repent with their whole heart and ask for it, should be received into the Church and therein saved unto the Lord” (Ep. lv, “Ad Antonian.”, n. 29). Elsewhere he says that many who do not do penance or confess their guilt are filled with unclean spirits; and by contrast he praises the greater faith and more wholesome fear of those who, though not guilty of any idolatrous action, “nevertheless, because they thought of [such action], confess [their thought] in sorrow and simplicity to the priests of God, make the exomologesis of their conscience, lay bare the burden of their soul, and seek a salutary remedy even for wounds that are slight” ("De lapsis”, xxvi sqq.). Origen (d. 154) compares the sinner to those whose stomachs are overloaded with undigested food or with excess of humours and phlegm if they vomit, they are relieved, “so, too, those who have sinned, if they conceal and keep the sin within, they are distressed and almost choked by its humour or phlegm. But if they accuse themselves and confess, they at the same time vomit the sin and cast off every cause of disease” (Homil. on Ps. xxxvii, n. 6, in P.G., XII, 1386). St. Irenæus (130-102) relates the case of certain women whom the Gnostic Marcus had led into sin. “Some of them”, he says, “perform their exomologesis openly also [etiam in manifesto], while others, afraid to do this, draw back in silence, despairing to regain the life of God” ("Adv. haer.”, I, xiii, 7, in P.G., VII, 591). This etiam in manifesto suggests at least that they had confessed privately, but could not bring themselves to make a public confession. The advantage of confession as against the concealment of sin is shown in the words of St. Clement of Rome in his letter to the Corinthians: “It is better for a man to confess his sins than to harden his heart” (Ep. I, “Ad Cor.”, li, 1). * that the sinner, if he would be saved, must overcome his shame and repugnance to confession. And since the series of witnesses goes back to the latter part of the first century, the practice of confession must have existed from the earliest days. St. Leo had good reason for appealing to the “Apostolic rule” which made secret confession to the priest sufficient without the necessity of a public declaration. 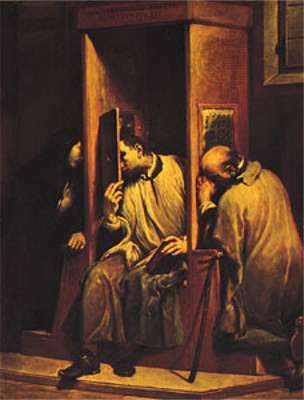 Nor is it surprising that Lactantius (d. c. 330) should have pointed to the practice of confession as a characteristic of the true Church: “That is the true Church in which there is confession and penance, which applies a wholesome remedy to the sins and wounds whereunto the weakness of the flesh is subject” ("Div. lnst.”, IV, 30).